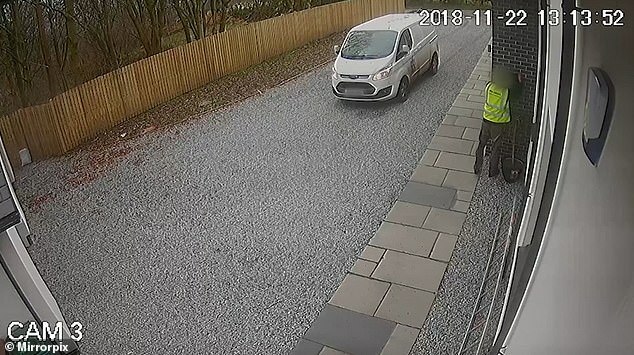 This is the shocking moment an Amazon delivery driver rooted through a customer's bins to steal three parcels that a colleague had dropped off the day before. The brazen theft was captured on CCTV installed by Chris Clark, 40, at his home in Kilsyth, Scotland. The delivery driver drops off an order of cables before making his way to the back of the house and taking the three parcels in the bins - Mr Clark's safe place for deliveries. The parcels were delivered on Wednesday, November 21 before being taken the next day. The man arrives at the property while driving a van for third party delivery firm JMHC. He was delivering a small box of cables and the footage shows him walking to Mr Clark's front door with the delivery box in hand. Nobody answers the door, prompting the delivery driver to go to the back and discover the bins filled with parcels. He returns to the front door, posting the cables into a mail box. The driver then walks back to the bins, walking around for a moment before seemingly deciding to leave. However, just before he reaches his car, the delivery driver has a shocking change of heart and decides to steal the parcels from the bin. He has to make two trips to get all of the parcels, which contained a casserole dish, bowls and some batteries. Art technician Mr Clark contacted Amazon after he couldn't find the three parcels. They replied with who photographic evidence showing that the parcels had been delivered. Mr Clark then decided to review his CCTV and found the shocking footage of the driver taking the parcels. He told the Daily Record: 'At first I thought maybe I'd lost them, they hadn't arrived yet or not been delivered to the right place. 'We could have maybe missed something small like the batteries, but not a big casserole dish. We knew something was up. Mr Clark said he contacted the police and that they will be visiting his house to view the footage. A JMHC spokeswoman told Mail Online: 'JMHC are horrified by the behaviour of this driver working on our behalf. 'All drivers are subjected to a criminal record check prior to starting work. An Amazon spokesperson added: 'We have very high standards for our delivery service providers and how they serve customers. 'We are taking this matter seriously and have reached out to the customer to make this right. A Police Scotland spokesperson said: 'We received a call at 10am on Sunday about the theft of parcels from outside a house in Kilsyth.